This is a very rare Hohner, made in Germany Quad Tremolo Harmonica! All the reeds sound great, and the harmonica plays wonderfully. This is a great harmonica and would make a wonderful addition to any musicians collection. Unlike the standard ten-hole harmonicas (built on the "Richter System", eg: Hohner's Marine Band) the blow and draw reeds do not share a common chamber, but are separated off from one another. This allows the player to isolate each reed. Hohner 98114 weekender tremolo harmonica in the key of C.
This is the Hohner #455 Echo Celeste in Bb. A popular, low cost Tremolo tuned harmonica. 24 double holes, 48 reeds, plastic comb. 7" long, 3-1/2 octaves. With instruction sheet, cloth, zippered case. The Hohner Echo Celeste Tremolo Harmonica has a double reed set for you to create vibrato in your playing. The double set of reeds on Hohner's Echo Celeste create music with a beautiful, vibrato effect. Hohner 455 Echo Celeste Tremolo Harmonica Key of C The double set of reeds on Hohner's Echo Celeste create music with a beautiful, vibrato effect. Special tuning produces a distinctive tremolo sound. Silver brass reeds, laser engraved covers, and padded zipper case. The tremolo tuning is neither under or over tuned in every note so that it will create a humming effect that other untuned one cannot compare to. For many players, they like this way of tuning for others they like the Suzuki ones. 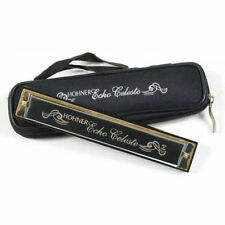 The double set of reeds on Hohner's Echo Celeste create music with a beautiful, vibrato effect. Special tuning produces a distinctive tremolo sound. Silver brass reeds, laser engraved covers, and padded zipper case. All holes seem to work. We might just take it. We look forward to serving you. See Hohner Harmonica website for more information. Great for learning that unique "Tremolo" sound. I believe the notes are in the key of C.
Er,The Up to Date Very Best Tremolo Concert Harp,Key C/G. the box shows its age but still is good for its age the harmonica plays like the very best and produces a great sound. We are not responsible for any tariffs or import fees. 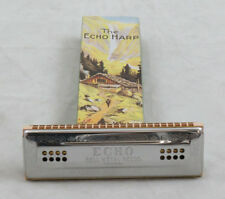 Hohner Echo Celeste. This 24 hole model produces a beautiful vibrato effect and is great for traditional ballads, folk songs, or gospel favorites. 24 Hole Tremolo Harmonica in A. I will be happy help you with this process. TREMOLO 5348. Type: tremolo. Comb: maple, brown. Comb surface: lacquer sample. Reed plate surface: brass. Key: CCDFGABb. Cover surface: stainless steel. Mouthpiece surface: maple. It has not been play tested. Includes original box. This item is sold AS-IS and does not include warranty. These reeds--which are basically identical--are tuned to slightly different frequencies. Harmonica is in fair used condition; lots of surface wear, including rust on the mouths but produces good sound. In original box but box is torn & missing tab. Net proceeds from the sale of these goods and financial donations from the community make it possible for us to operate our free job training programs. International Sunbird Harmonica. Tremolo Tuned. Outstanding German made Hohner 48-hole tremolo harp.